In addition to the problem of not getting food to people who need it, wasted food in landfills is also a major contributor to greenhouse gases (in the billions of tons) and places an enormous strain on precious land and water resources during its growth and production. While most of this food is wasted before it even reaches our homes (supermarkets rejecting produce because of the way it looks, for example), consumers are still throwing a significant amount of food waste in the garbage. 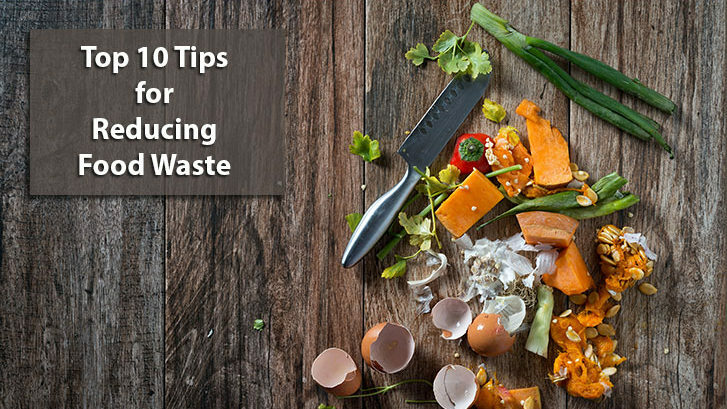 Help combat the worldwide epidemic of food waste with the following tips, just in time for World Food Day, this Sunday, October 16. How often do you find yourself at the supermarket trying to remember what you already have in your fridge? Take stock of what you have before you leave home and use shopping lists or apps so you don’t impulse-buy food that will most likely end up in the garbage. Some grocery list apps, like Out of Milk, even let you enter what’s in your pantry so your shopping list and inventory are all in one place. Plan meals a week at a time so you know exactly which ingredients and how much of each you will need. Buy loose instead of prepackaged produce so you only use the exact amount your recipes’ call for. Hit the bulk bins to buy items that are available there for the same reason. Buy the not-so-pretty looking produce that’s otherwise good. It might end up in the garbage because no one else wants it. Did you know that some fruits and vegetables shouldn’t be stored together? Some give off high amounts of ethylene gas, while other are hyper-sensitive to it. Because this gas encourages ripening, these two types of produce shouldn’t be stored together. The American Heart Association has a quick reference about the proper storage of fruits and vegetables as well as an infographic to help you curb the amount of food waste you’re disposing of. Even if you’ve stored your produce properly, there will be times when fruits become over-ripened and vegetables wilt before you finish them. These fruits can be used in smoothies and the vegetables can be used in soups rather than being dumped in the green bin or worse, dumped in one of our garbage bin rentals (there’s a surcharge for organic waste in our bins). Sadly, our own fridge is usually in various states of disarray, depending on how much takeout we’ve had any given week, so trust us when we say that this tip is as much for us as it is for you. Whenever you’re restocking your fridge or storing new leftovers, practice the FIFO (first in, first out) principle and store new items in the back while moving the older items to the front. This will help to prevent you from having to trash all the forgotten leftovers from the back of the fridge every week on garbage day. In addition to making sure the contents of your fridge are rotated regularly, did you know that it’s also helpful to store certain types of food in specific areas of your fridge? We didn’t! Until we came across this infographic from Food Republic, that is. Consider yourselves one of the enlightened. The confusion around the meaning of expiration and best before dates is most likely one of the biggest contributors to food waste in our homes. The battle in your head between guilt and safety every time you’re staring at food past its best before date usually results with safety as the champion and the food in the garbage. Learning more about what these dates actually mean and about how they apply to different products can help reduce the amount of food you have to dispose of. Know your guests’ or family’s appetites and control the amount of food you make. Even though we live in an age of over-sized portions, especially at restaurants, most people actually can’t eat that much at one sitting. Save takeout containers or buy inexpensive containers for leftover food that you can send home with your guests because let’s face it; you’re not going to eat turkey for a week. Save the full sized meal you have left over from your full sized meal at the restaurant and label it with the date so you can track how long it’s been lurking in your fridge next time you pull it out. If you or your family aren’t a huge fan of eating leftovers, get creative and make new dishes with them using the endless supply of recipes available on the internet. This might sound obsessive, but write down all the food waste you get rid of. Keeping track of what food you waste regularly will help prevent you from wasting the same food in the future. If you’re always having to throw out half a bag of carrots, don’t buy a bag! Monitoring your waste will also take the guesswork out of quantifying how much food you’re wasting. With more concrete amounts, you can hold yourself more accountable and stop wasting as much food going forward. More than likely you will start to hear echoes of Africa and your mother’s voice in your head shortly after doing this. If you have food that will be expiring soon or can’t stomach the idea of eating anything past its best before date, check with your local food bank to see if you can donate it. Many of them accept food past their best before dates, especially canned goods, which may be accepted up to a year after their best before date. Find your local Canadian food bank here. 9. Can or Pickle it! We love our pickled vegetables! If you have more fruits and vegetables than you know what to do with, and have some time to spare, try canning or pickling them. Here’s a cool beginner’s guide to get you started. Last but not least, if you have a garden or a spectacular lawn that’s the envy of your neighbours, food waste can help you save yourself money on fertilizer. Let your leftover food do double duty by composting it. These are just a few ideas of what you can start doing today to help stop the worldwide epidemic of food waste. Reducing the amount of wasted food will not only help you save money, but will also help save the environment. Follow us on Facebook or Twitter for more tips on reducing waste!